While my daughter paid homage to the muse of dance on Sunday in Eastbourne, I killed time with a run. Starting near the start of the Beachy Head Marathon, I ran first out towards Beachy Head, taking the lower path to Cow Gap, and then back and along the front to Princes Park, eight miles in all, further than I've gone for a long time. The first couple of miles were hard, but then I found a good rhythm for the section along the front, dodging the pensioners with ease. At the start the sky was cloudy, but as the morning wore on, gaps appeared, at first enough to patch a sailor's trousers, by the end, sufficient to cover the nakedness of the whole fleet. I haven't written here for too long, but there's been little to write about. I can claim one run last Sunday, the short route over Seaford Head. As I toiled up the hill towards the barn, a seam of snow still lay under one hedge halfway up the hillside. I had a nasty coughing fit about half a mile out, and was nearly sick, but pressed on. There's hope though. For the next six Sundays I'll be taking my daughter to Eastbourne on Sunday mornings for rehearsals for a dance production she's in,, to appear at the Eastbourne Dance Festival. This gives me two hours to kill in Eastbourne, which must be good for twelve miles, along the front, up Beachy Head and over to Birling Gap, or inland to Jevington and back. There's nothing else to do there, after all. If I could squeeze a couple of weekday runs in, perhaps some speed work, I'd have a reasonable training programme for Hastings, which I've decided will be the first race of the year. The weather gods having answered the prayers and sacrifices of much of the nation for a snow day, it would have been impious and dishonourable not to mark the day with a run. By the time I was ready to go, half an hour before sunset, the only off-road trip possible would have been the one I ran yesterday and I don't like to repeat the same route on consecutive days. So, though I ran on icy paved surfaces, rather than Sweder's heroic hills, my trip to Seaford front, as far as Bonningstedt Promenade and back, was fitting and enjoyable. The cliffs were lit by intense light, and the tide was high. There were few people around, so I could concentrate on where I was putting my feet, rather than the toddler, dog and granny dodging that usually characterise this route. I wonder at the apparent collapse of an advanced civilisation, faced with some snow and ice. On the other hand, as long as the closure of my workplace continues to present unexpected running opportunities, perhaps it is not altogether a bad thing. And it can produce beauty such as I saw this afternoon, or in this satellite image from NASA. Confined to Seaford by the inability of Southern railways to get me to work, I had a day working from home, and thus the opportunity to run, just before dusk. I like my snow like I like my women: crunchy and frozen on the top, but yielding to a firm tread. Today's was wetter than the ideal, but good nevertheless. I set out along Chyngton Way to the foot of the hill to South Barn. Progress was slow on the slippery pavements and the track up the hill, but then I reached the top and flat, untrod paths, edged with fields of chilly sheep. The snow fell lightly here, blown a little by the wind. Everything was grey, and I could not tell where sky ended and sea began. To the east I could only make out parts of the Seven Sisters. I could see icicles under some of the cliff's overhangs. Then there is the descent, the same descent that slows up the end of Seaford half-marathon. I took this very slowly. A little way inland tobogganers slid down the slopes. Just as New Year's Eve gave the pleasing meteorological coincidence of a full moon and clear sky, New Year's Day was bright and sunny, with little wind, ideal conditions for the Seaford Striders New Year's Day run. I jogged down to the Martello Tower for 11 am, to join roughly twenty runners of varying ages. We ran from the Martello Tower to the sailing club, paused to regroup and then ran back. At the finish President Rob graciously poured us all a glass of champagne, a fine start to a new running year. 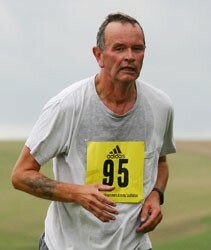 The races for the 2010 Sussex Grand Prix are now known, which will give some structure to my running year. My intention is to enter some of those Grand Prix events I haven't run before.